Elastic contact planes simulating an indentation test. Four contact planes bounded by polygons (triangles in this case) form a very rigid pyramid shape simulating an indentor. Even though the material is linear elastic and small deformations are used, the problem is highly nonlinear due to contacts with the planes. Checking the tangent matrix by finite differences by setting ‘check’ in ‘nls’ solver configuration to nonzero is rather tricky - the active contact points must not change during the test. This can be ensured by a sufficient initial penetration and large enough contact boundary polygons (hard! ), or by tweaking the dw_contact_plane term to mask points only by undeformed coordinates. rigid pyramid shape simulating an indentor. problem is highly nonlinear due to contacts with the planes. the dw_contact_plane term to mask points only by undeformed coordinates. k = 1e5 # Elastic plane stiffness for positive penetration. f0 = 1e2 # Force at zero penetration. 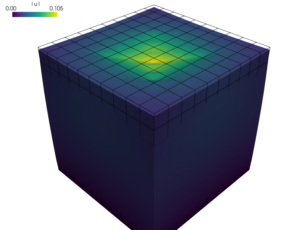 dn = 0.2 # x or y component magnitude of normals. ds = 0.25 # Boundary polygon size in horizontal directions. az = 0.4 # Anchor z coordinate.